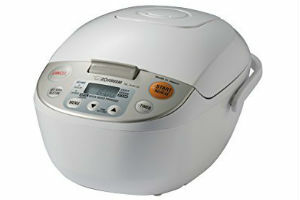 The Zojirushi NS-TSC10 or NS-TSC18 rice cooker has very similar features as the model NS-ZCC10 but they do have a few differences such as price, color, steamer, included accessories and where it has been manufactured. The price is pretty decent to me. It costs about $40.00 more than my current rice cooker. Well, the reason it costs a little more might be mostly due to inflation. After all, I have had this rice maker for about eight years, and very soon will be 9 years. I wouldn’t be considering buying a new one if I can just buy a replacement for the inner pot. This model is also made with two available choices in rice capacity to choose from. The sizes are 5 and 1/2 and 10 cups. Don’t be confused with the rice capacity of cooked and uncooked rice. Those two sizes are for uncooked rice. It should yield you more with cooked rice. If you want to know the difference between the two models of Zojirushi NS-TSC10 and NS-ZCC10, you can do so by clicking here. This is my second option for a non stick rice cooker. Who knows, I might go with a stainless steel inner pot rice maker. What Can You Do With This Cooker? Is The Inner Lid Removable And The Cord Retractable? Can I Use Any Kind Of Measuring Cup? Can Replacement Parts Be Bought? This rice cooker not only looks nice but also helps you to make food a lot more easier. Here are the built in features with this model. 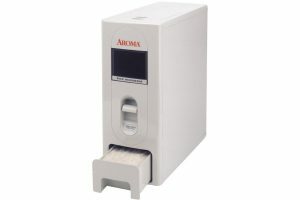 Has a built in Microchip that is to help automatically adjust the cooking temperature and time on the rice. A lot of the simple ones don’t have this function. The body or exterior is coated with stainless steel materials for easy cleaning. It will let you know the rice or food is done cooking with a melody sound. You will also have the option to change the melodies to a beeping sound instead or set it to no sound. It is your choice to make. You will be able to have an option to cook your rice at a certain time you set it to with the delaying function. It has two preset timers. The following is the initial setting for the timers. 1 is to set it to 6:00 and 2 is 18:00. If you are using the same setting then you don’t need to change the time again. For example, if you select choice 1 at 6:00 and change the time from 6:00 to 7:30 then your rice will be ready at 7:30, like you set it to. If you use the same setting again for tomorrow then you don’t need to change the time again. It is pretty convenient. This function is for people who don’t have time to cook their rice at certain times. This one has a quick cook function as well. Sometimes it helps if you get delayed from cooking your rice from 10 to 20 minutes. The quick cook setting can help make up the delaying cooking time for you. Click here to see the quick cook setting for the cooking time. The inner pan is nonstick, so it makes cleaning a lot faster and simpler without having to soak the pot. It also won’t burn your rice. Who likes to eat burnt rice? You can use the unit to cook the following kinds of food, white, brown, mixed rice, porridge, sushi rice, sweet rice and even use it to bake cakes. That is the first time I heard you can use a rice maker to bake a cake, and yes you can use it to steam your buns, vegetables, fish and a lot of other kinds of food. 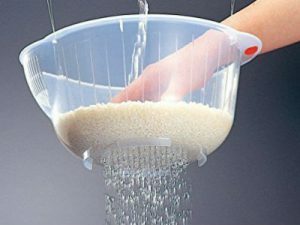 Steaming function can be used along with cooking the rice or alone without the rice. I would like to mention it has an automatic keep warm and extended keep warm setting and also a reheat function. The reheat function is for reheating your cooked rice to a much hotter temperature. It does require you to add a little water in it and it doesn’t take that long for the reheating process to finish. It is about 7 to 9 minutes long. It is worth the wait because hotter rice always tastes better. Yes, I know some of you would like to know how long it takes to cook rice for this model. Some of you might consider the cooking time to be reasonable to have better tasting rice and of course some of you might feel it takes too long to complete the process for this model. As you know, cooking rice in a rice maker has different cooking times for each model, so the below chart has an estimated cooking time. The actual cooking time varies depending on the conditions, like the room temperature, voltage, season and the amount of water being used. 29 minutes to 40 minutesWhen Quick Cook setting is being used. 30 minutes to 45 minutesWhen Quick Cook setting is being used. It is a yes to both questions. Having a removable inner lid is so much easier for cleaning the rice cooker, because you can’t put the whole rice cooker in the sink and immerse it in the water. It is designed not to do that. On the other hand you can just remove the lid and bring it to the sink and wash it with mild detergent with a sponge and you are done. Cleaning it this way is much more clean than just use a damp cloth to wipe it clean. Don’t you agree? As for the power cord most basic rice makers don’t have a retractable cord. At least I haven’t come across one so far other than a more decent one. With a retractable cord it is much easier to move it around if you needed to. That means no more power cord dangling in your way. They pretty much are the same rice maker. They both have the same cooking functions and looks. It really doesn’t have that much difference. The only big difference is you are able to use the NS-TSC18 to cook a lot more rice than the other one. It can cook up to 10 cups of uncooked rice and it should yield you about 20 cups of cooked rice. Zojirushi is pretty accurate on the cooked rice. Some other rice makers state it can cook up to a certain amount and yield you with a certain amount but when it comes to the actual cooking the result is not the same as it stated. The outcome is a lot less. Maybe they have a different measurement. Anyway, please look at the following chart to see the differences. Weight About 10 PoundsHow much does it weigh? The biggest difference between these two items are the NL-AAC10 is beige color, has a detachable power cord, no spatula holder and it doesn’t have a cake menu setting. As for the NS-TSC10 unit, it is stainless steel color on the body, and the power cord is retractable with a cake cooking function. Of course the dimensions and weight will be different for both items. The Zojirushi NS-TSC10 is a lot more popular than the NL-AAC10 model. Please look at the below chart to see a complete list. 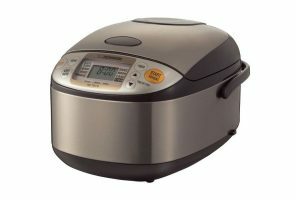 Rated Over 62+The number of customers who rated this rice cooker. Power Cord Length 3.7 FeetWhat is the length for the power cord? Made In JapanWhere does it made? Made In ChinaWhere does it made? Some of you might just pick a cooker that has to be dishwasher safe for easy clean up. I totally understand that because some of us have a very busy schedule. Sadly this model is not dishwasher safe with the inner pot according to the manual. You should hand wash the inner pot and all the accessory parts with a mild detergent with a sponge without the abrasive side. That is to prevent the inner pot from having scratches and discoloration from the dishwasher. You shouldn’t use any metal utensils for serving the rice. It will cause scratches and peeling from the non stick coating. If you want the nonstick to last longer then you should do as the manual said. With my research, I have found some users put this model’s inner pan in the dishwasher for cleaning. I think either it doesn’t matter to them or maybe they haven’t read the manual. Here are the following accessories included when you purchase it. No, you can’t just use any kind of measuring cup to measure the rice level. Whatever additional measuring cup you have may be different. Doing so, your cooked rice might have a dissatisfying result. To be honest, my mom has done that a couple of times with the old measuring cup from the old rice maker until I told her not to use it. She thought both measuring cups are the same in size. I am happy to say YES for this model. All the replacement parts can be bought from Zojirushi.com such as the lid, spatula, spatula holder, measuring cup, streaming basket and the inner pot. The inner pot costs the most of all those parts. You might be able to get the inner pot by clicking here. The steaming basket is BPA free if you are wondering about it. I always worry myself about using plastic items in the kitchen as well. I totally understand that. Here is another rice maker made by the Zojirushi brand that has an excellent average rating and it is still maintaining its rating throughout all these years. Zojirushi is the brand you can trust to make high quality rice cookers out in the market. Like I said before, this is my second choice in a nonstick rice maker. Pros: It is easy to clean and sturdy. The cooked rice comes out nicely every time. Great two delay timers feature. Cooked rice is still in an excellent condition after it has been in the keep warm mode for a very long time. A retractable cord is a plus. Cons: Several complain it takes too long for this model to cook the rice. You have to understand to have tasty rice, it takes time to cook them. To solve this problem, all you have to do is either use the timer to cook at certain time or prepare ahead of time before dinner time. You should start cooking your rice first before preparing your other dishes and before you know it, the rice is done cooking. It usually takes me an hour to cook our meals including the cooked rice. A few are experiencing the non stick inner pan is having scratches and peeling. It is possible that they are not following the instructions on how to clean it, like they might put it in the dishwasher and use metal items to serve the rice. The manual specifically states not to use dishwasher and metal items. It also states the non stick coating will discolor or peel off with normal usage through time and it is harmless to your health. It has a one year limited warranty to cover defects for this unit. It doesn’t cover accidents like if you drop it on the floor, and it also doesn’t cover misuse. You should save your purchase receipt in case you ever need repairs for defects. You can find the manual by clicking here. The manual is about 27 pages long and about 13.6 mb in pdf format. It is written in English only. You should get a hard copy instruction manual since Zojirush.com states that the instruction manual is in English, Traditional Chinese, Japanese, Korean and French. Well, I could be wrong. This unit is made in China, but if you want one that is made in Japan please try the NS-ZCC10 model. Click here to read my Zojirushi NS-ZCC10 review.